Divisibility Rules. So first of all let's start with a couple easy questions. Is 56 divisible by 7? Is 50 divisible by 13? Theoretically those are questions you should be able to answer with little problem, the answer to the first of course is yes, 56 equals 7 times 8. The answer to the second of course is no. Thirteen does go into 52, but it does not go into 50. So first of all I'll just mention if these are not questions that you can answer just by looking at them probably you need to practice your times tables a little bit more. You really need to have your basic times tables down so that questions like this are in fact very easy. Now a slightly harder question is that long number divisible by 3? Well no one expects you to do this division in your head. We can't do the full division and find the quotient, but we can use a divisibility rule to answer the question. 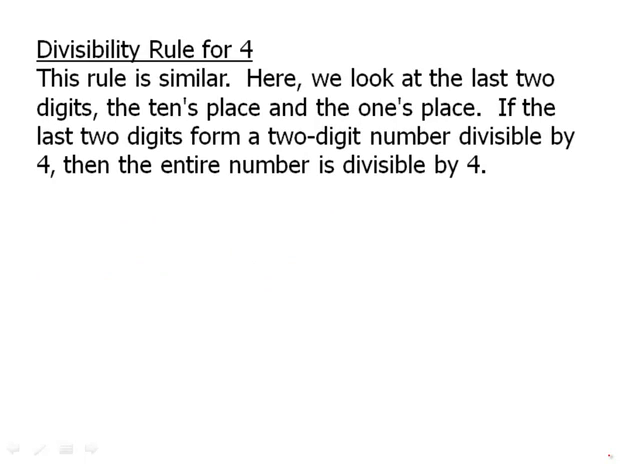 The test loves these divisibility rules. So, first of all divisibility by 2. Of course all even numbers are divisible by 2. To tell whether a large number is even, all we have to do is look at the last digit. If the ones digit it even, then the number is even. So we have these large numbers. We can ignore the rest of the number, and just look in the ones place. And in the ones place we see 5, 1, 7, three those are all odd, but the 6 is even. That means that the middle one, with the ones digit of 6, that's the only even number, the only number divisible by 2. So that's divisibility by 2. Divisibility by 5, this is another divisibility rule that involves looking at the last digit. If the last digit is a 5 or a 0 then the number is divisible by 5 otherwise it isn't. So again we have big numbers like this. We can ignore the rest of the number and just look at that last digit. Indeed we have a last digit of 5, so that number is divisible by 5, but the others do not end in 5 or 0. So they are not divisible by 5. So both of those rules, divisibility by five and divisibility by two, those just involve looking at the ones place and nothing else. Now the rule for 4. This rule is similar, here we look at the last two digits, the tens place and the ones place. We have to look at 2 digits. If the last two digits form a two digit number divisible by 4, then the entire number is divisible by 4. So again our same list of long numbers. Look at those last two digits and think of them as two digit numbers, 55, 41, 96, 37, 33. The only one among those that is divisible by 4 is 96. 96 is a number divisible by 4, so that means that that whole middle number is divisible by 4. Now divisibility for 3, the test loves this rule. This rule is a little different. Here we add up all the digits of the number, if the sum of the digits is divisible by 3, then the number is divisible by 3 and if the sum of the digits is not divisible by 3, the number is not divisible by 3. So for example, with 135, we add 1 plus 3 plus 5 that's 9, since 9 is divisible by 3, 135 must be divisible by 3. With 734, we add 7 plus 3 plus 4, that equals 14. Since 14 is not divisible by 3 we know that 734 is not divisible by three. 1296, we add 1 plus 2 plus 9 plus 6, that equals 18. And since 18 is divisible by 3 then 1295 must be divisible by 3. So it works the same way for large numbers. Here's the question we had at the very beginning in the module. So is that large number divisible by 3? Well, here's what I noticed, I notice that, that middle 3 plus 3 plus 4 that equals 10. I can take the 5 plus 5 that equals 10. And that only leaves a 1, a 0, a 2, and another 1 and those add up to four. So that means everything adds up to 24. The sum of the digits of 24 is divisible which is divisible by 3. So the original number must be divisible by 3. So all we have to do is add up the digits and see if that's divisible by 3 and then that tells us whether the number over all is divisible by 3. The divisibility rule for 9, this is exactly like the rule for 3. Add all of the digits. If the sum of the digits is divisible by 9,. Then the number is divisible by 9. If the sum of the digits is not divisible by 9. Then the number is not divisible by 9. So, for example, 1296, we've found on the last few slides, that the sum of this was 18. The sum is divisible by 9. So 1296 must be divisible as well. 3072, we add these digits up we get a sum of 12. So the sum of the digits is divisible by 3 but not 9. So the number is divisible by 3 but not 9. Notice incidentally 3072, the last 2 digit number is divisible 4, so that's the number that would be divisible by 3 and by 4. Which would mean, it's divisible by 12. We can also use the divisibility rule for 9 for larger numbers. So, is this large number divisible by 12? Well we already found out that the sum of the digits is 24. So 24 is divisible by 3, but not by 9. So the original number, that 9 digit number, is divisible by 3 but not by 9. The divisibility rule for 6. Here we're gonna have a combination. In order to be divisible by 6, a number must be a, divisible by 2, and b, divisible by 3. We check divisibility by 2 by looking at the last digit making sure that it's even, and we check divisibility by 3, by finding the sum of the digits. So, any even number divisible by 3, has to be divisible by 6. Is 1296 divisible by 6? Well, first of all we know it's even. The sum of the digits we found already is eighteen, which is divisible by 3. Therefore 1296 is divisible by 6. Is this long number divisible by 6? Well clearly it's even that's easy to determine, we add the digits add the first three they add up to 15, the second three digits add up to 14, the last three digits add to 17, 15 plus 17 plus 14 is 46, the sum of the digits is not divisible by 3. So the original number is not divisible by 3 or by 6. In this video we discussed the most common divisibility rules, the rules for 2, 5, 4, 3, 9 and 6.